Usually, when we read statistics we don’t pay attention to them, until, we unexpectedly lose one of our loved ones to a heart attack. Let’s check out how Kaiser Permanente can help you and your family have a healthy heart and recognizes the signs of a heart attack. Get your regular screening with your doctors to keep track of blood pressure and cholesterol. Blood pressure OVER 120/80 and BMI of 25 or HIGHER, increase heart disease and stroke. Eat fresh and health fruits, vegetables, and proteins. Design an eating program that work with your food preference and weight goals through our online resource Nourish. Recognize the signs of a heart attack and don’t disregard them. Many people and even some doctors do not recognize the early signs of a heart attack. 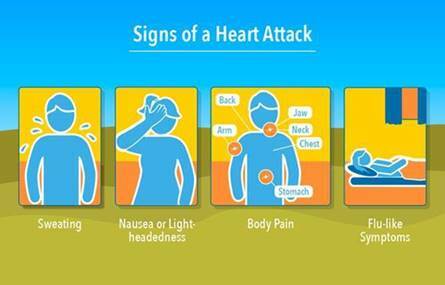 Do YOU know the signs of a heart attack?